It is the hubris of every age to believe that the past was neat and simple and not a little quaint. “Look at those crazy clothes!” we say. “Look at their ridiculous medicine! Look at the inappropriate way in which they entertained themselves!” Which of course dooms us to learn from neither their mistakes nor their successes. For what can one gain from idiots, buffoons and fops? That said, it may still appear to some that reviewing a book about the age of the Virgin Queen – a book that tries to place the reader into the everyday world of commoners of late Tudor England – on a site dedicated to books relevant to the advertising industry may seem like a bit of a stretch. What possible relevance, one might ask, could the late 16th century have with the early 21st? Raise your hand if that sounds like anything you’re living through right now. Still, some may remain unconvinced. “This is not merely the 16th century”, they cry, “this is England in the 16th century! An entirely different country from an entirely different time.” Ah, but hold on. Because those early settlers whom we celebrate the last Thursday of every November carried the DNA of this very society with them and they used it – frozen in a kind of cultural amber – as a foundation that the subsequent colonies were built upon, even as that culture evolved entirely differently in the mother country. All the fundamental building blocks of Elizabethan England are, because of the Massachusetts Bay Colony, in some ways more a part of America’s history than they are a part of England’s. And to be clear, this has nothing to do with having ancestors on the Mayflower – it has to do with being impacted by the country the guys on that ship set the first batch of rules for. That’s not to say it’s a simple mirror. There are some important differences, and Mortimer sheds intriguing light on these as well. For example, the portrait of “Good Queen Bess” that emerges is of a monarch far more tyrannical and dictatorial than we are used to. We see someone with not only absolute control but also with a clear intent on extending and protecting that control with an almost paranoiac zeal (not that one can blame her, I suppose; when your big sister throws you in prison for treason it’s bound to make you a little skittish). Elizabeth limits the aristocracy, keeps Parliament out of session, and personally manages all promotion and favor. In short, all advancement passes directly through her, and precious little of it was there to be had. It is probably too far to say that she reminds one of Stalin, but that the comparison is even contemplated is shocking enough. So let he who is beyond perspective cast the first stone. 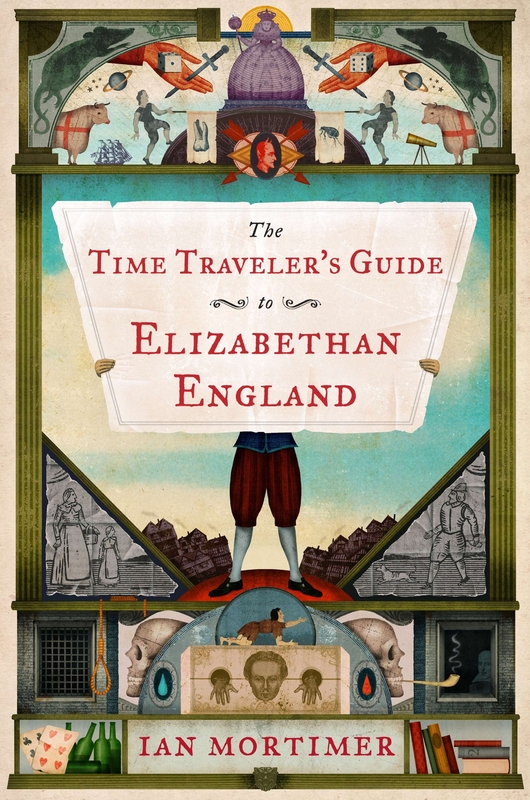 The Time Traveler’s Guide to Elizabethan England by Ian Mortimer was published by Viking on 06/27/13 – order it from Amazon here or from Barnes & Noble here – or pick it up at your local bookseller ( find one here).